Let's get this out of the way right now: Digimon: The Movie, taken in its entirety as a complete entity, is really really bad. It cobbles together three completely unrelated movies- one vital to the canon, one that's kinda-sorta canon and one that is absolutely not canon. With those three movies, it takes the one that got spoiled on the trip over and attempts to integrate it among the other two. Then it adds in a bunch of silly ad-libs and a bunch of hit songs that took the 90's by storm... which isn't such a good thing for a movie that came out in 2000. It says something that the silly ad-libs ended up being the best part. In an effort to be thorough, we will revisit all of the movies based off the TV shows. Or watch for the first time; I haven't actually seen the Frontier or Data Squad movies. We'll only do X-Evolution if you ask really, really nicely. Typically these will happen corresponding to when they premiered in Japan. The third part of Digimon: The Movie premiered right around where we are in Zero Two, so we're cranking the whole thing out right here... in three parts because they should really be three different movies. Besides, this way, we can talk about each of the segments in relation to where they actually belong. None of this “at the same time in America” crap. Without the third movie wedging itself into everything, the first two parts aren't so bad... on the surface. Segment one looks cute, has an innocent little plot about two monsters destroying the neighborhood and has a certain mysterious element to it that allows it to hold its own. It's just rendered totally unnecessary and semi-inaccurate once we pass that part in season one. 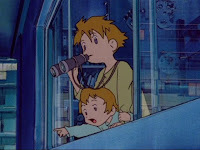 The first movie, simply called “Digimon Adventure,” actually came out before season one even started. Sort of a prelude to the madness, whetting our appetite and making us anxiously sit through all the Devimon and Etemon episodes until things would get real again. In covers the Highton View Terrace incident, where Kari and Tai find a digiegg and watch it hatch into Botamon, only to see it progressively evolve into Greymon in order to curb-stomp some Parrotmon who came down to raise hell on the city. The events themselves aren't the problem: they're consistent with what we're told in the show (if anything, it's the show that stretches logic when the digidestined forget about this extraordinary event when confronted with Digimon again). It's the presentation that causes issues. First off, Kari is supposed to be four here, yet she sits in a high chair and is barely capable of speech, opting instead for her trademark whistle which may double as a pacifier (for her... not so much for the family, I'd guess). Whatever her age, the opening moments take us back into Lain territory as strange patterns appear in the sky and Kari appears to be interfacing with the Wired. When Tai walks in, the digiegg pops out. It all goes crazy from there. The other major issue is that all the digidestined seem to know each other. Sora's mad at Tai, Joe's trying to call Mimi and Izzy, TK and Matt are... okay, they know each other. So why are they all surprised later to find they all used to live in the same area? It's a short-sighted dub error that adds little and takes away a lot. Other than that, it's a harmless little thing. Even with the random outburst of The Rockefeller Skank. This movie starts out with something called a DigiRap. It's absolutely hideous. It's like somebody heard those awful raps Pokémon had and decided that Digimon needed something even worse. Given that this production was a cash grab in the wake of the Pokémon movie, it feels like one big inferiority complex until the sudden shot of two monsters killing each other restores balance to the Force. So let's get this straight... Mom leaves a seven year old and a four year old home alone, while the seven year old is using the stove to make breakfast? At least we're introduced to her health food gag, which makes for pretty good comedy in segment two. The pretty good comedy in segment one is Koromon's preferred display of affection- latching onto your face and kissing it. That never stops being funny. 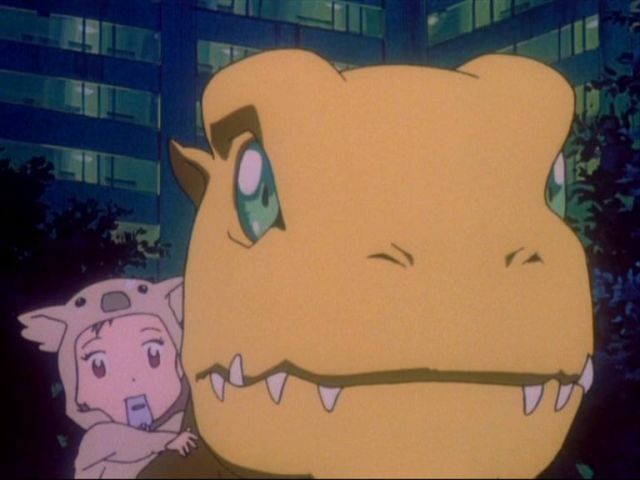 It's amazing how normal-size Agumon appears lovable, even in Data Squad, while big Agumon is frightening beyond all reason. I might be wrong on this, but I believe that Taichi and Hikari are of younger age than what you mentioned there. The dub increased their ages by one, so Taichi's actually 6, and Hikari's 3; possibly 2 and a half if you consider the Japanese education system and Hikari's birthday (though from what I know no canon birthday is given; so this point might be invalid, but is one for you to consider. Anyway, some sources say Hikari's birthday is January 16, so we'll go with that. ); since in Japan, school term starts on April and every child born after that would have to attend school the following year instead; Both Takeru and Hikari, though both age 8 and in second grade at the time of adventure01, Takeru is possibly 8 turning turning 9 (since Takeru's birthday is thought to be september 25, and at the time of their "summer camp"(august 1st) he is still 8 years old.). So in any case, the odds of Hikari being much younger than 4 is very high here, which explains why she is behaving more like a toddler than a four year old child. As for Taichi, I guess it depends more on the upbringing of the family. Yuuko Yagami (Taichi and Hikari's mother), does seem to be sort of a klutzy parent, leaving her young children at home by themselves and all sorts of things. Taichi probably had to start learning to be independent at a pretty young age I'm guessing. The thing that's missing here is the review of the real movie. Alot of things you point out being wrong is due to the american editing, like the kids knowing each other or the awful music. Taichi, in the japanese version, didn't know any of the other kids and vice-versa. The american editing seriously butchers all of the movies, but this one specially. I remember seeing the Nostalgia Critic review of this movie, which made it really interesting because the two reviewers involved were a Digimon fan and someone who'd never watched the show before. Needless to say, both of them hated it. One funny part was where the Critic has to have the concept of Digimon explained to him, and he cheerfully compares it to a Tamagochi (sorry about spelling, btw). Cue scene where giant Agumon tears up the place. (Stunned look) "Wow, my Tamagochi never did that. I usually just let it die."